My book on horary is finally available in Kindle format. Buy now! 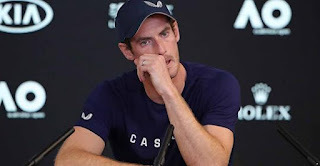 Andy Murray has just announced in an emotional interview his “possible” retirement from tennis due to a serious hip problem. Does this problem show in his nativity?’ Oh yes. We have two rulers for the body in general, the ruler(s) of the ascendant and the Moon. The ruler of his ascendant, Mercury, is very strong in Gemini, conjunct the MC, and this is a strong indication for success in his field, but also gives a strong constitution. The Moon, apart from being a general significator for the body, rules specific organs like all the planets do. One of the Moon’s characteristics is that she rules the organs attributed to the sign she is in. In Murray’s chart, the Moon is in Sagittarius and so she rules the hips among other things. Is she in a good condition? No, not at all. She is afflicted (besieged) by both the Infortunes, Saturn and Mars, with Saturn also being the ruler of the 6th house of illness. This makes the Moon severely afflicted and at some point in the life, she was going to cause problems. What’s more, Venus, the 9th house ruler (hips), is in detriment in the unfortunate 8th house, so no help from her. The Sun, another 9th house significator because of his presence there, is close to dangerous fixed star Algol and in primary directions he is conjunct Venus, therefore activating her. The problems started during his Saturn return in Saggitarius, which was something to be expected. I hope he gets well and returns to tennis, because he will be missed. Is death shown in an astrological chart? Of course. Is the prediction certain? It’s as certain as predictions go, the success rate is the same as with predictions on all the other areas of life. If one wants to stay away from such matters, it’s perfectly understandable, but they must not go around claiming that these matters are beyond astrology. Here is Montserrat’s chart (a bi-wheel with secondary progressions). It has a B Rodden rating. The time was taken from her biography and not from a birth certificate, hence the B rating. However, it seems to work quite well (for her death at least). We see immediately that the secondary progressed ascendant is conjunct natal Saturn or, if you prefer primary directions, we have Saturn directed to a conjunction with the ascendant. It’s the same thing. Saturn is the Greater Infortune and the most obvious anaereta (killing planet), particularly in a nocturnal chart. Saturn, though, seems quite well-behaved in Aquarius and had the chart been diurnal, he could perhaps be called a benefic. At the same time, however, we have a Mars/Mars square (primarily directed Mars squaring his natal position) and this aggravated things. Mars rules the gallbladder and he co-rules the 1st house (Montserrat herself) and 6th house (illness) in her chart. Caballé died (ascendant conjunct Saturn) a month after entering the hospital because of a gallbladder infection (Mars square Mars). Natalie Wood's death – Accident or murder? For those of you who don't know who Natalie Wood was, she was a famous Hollywood actress who died at the age of 42 under very mysterious circumstances. According to wikipedia: “During the making of the film Brainstorm, Wood drowned while on a weekend boat trip to Santa Catalina Island on board the Splendour. Many of the circumstances surrounding her drowning are unknown; it was never determined how she entered the water. She was with her husband Robert Wagner, Brainstorm co-star Christopher Walken, and the Splendour's captain, Dennis Davern, on the evening of November 28, 1981. Wood's body was recovered by authorities at 8:00 a.m. on November 29, one mile away from the boat, with a small inflatable dinghy, named the Valiant, found beached nearby. According to Wagner, when he went to bed, Wood was not there. The autopsy report revealed that Wood had bruises on her body and arms as well as an abrasion on her left cheek”. And: “In 2011, Walken hired a lawyer when authorities reopened the Wood case. Authorities stated that Walken is not a suspect. Wagner has denied any involvement in Wood's death but was named a person of interest in the investigation in February 2018” In reality, Robert Wagner could never shake off the - so far ungrounded - accusation that he was somehow responsible for the death of his wife. Can astrology shed some light on this? Let's start with Robert Wagner's chart. His 7th house of relationships has Venus as its domicile ruler and the Moon as the almuten. Venus is combust and the Moon, although in domicile. is afficted by her arch-enemy, Saturn. This indicates problems with relationships. He had a couple of divorces (one was with Wood herself) and of course, he lost a wife. The sιgnificators of the wife do not seem afflicted by his own significators (Mars and Jupiter - Jupiter is the ascendant term ruler). Mars is in the same sign as Venus but they are quite far from each other and Venus' major problem is the Sun, not Mars. The Moon is afflicted by Saturn, but Saturn is not one of Wagner's significators, while Jupiter hurts neither the Moon nor Venus. However, Jupiter is the term ruler of the ascendant and also ruler of the 2nd house, the turned 8th house (death of wife). I believe very much in the term ruler of the ascendant, as this differentiates people born on the same day and have the same ascendant, but that's my own theory and not part of the tradition, so it needs to be taken with a grain of salt. However, the same pattern repeats in the solar return chart for the year his wife died. First of all, the SR chart has a Taurus ascendant (the natal 7th house) indicating relationship issues for that year. His wife is Mars and she is conjunct retrograde Mercury in detriment, with Mercury being the turned 8th house (the radical 2nd ) and the term ruler of the ascendant at the same time, thus repeating the natal pattern. Anyway, whatever the value of the term ruler, Natalie's death is clearly shown by the Mars/Mercury conjunction. Finally, around the time of Natalie's death, in primary directions, the MC/IC axis was conjunct Saturn, therefore activating the natal Moon/Saturn opposition, indicating her death. Let's move to Natalie Wood's chart. Does her chart indicate a short life? First of all, she has a Libra ascendant and in most cases this goes together with Taurus in the 8th house, so the same planet rules both life and death. This by itself is not some serious testimony, but it could be the icing of the cake if there are other concurring testimonies. Her ascendant domicile ruler is Venus, in fall and in the malefic 12th house, but she is in her triplicity and terms, so things could be worse. 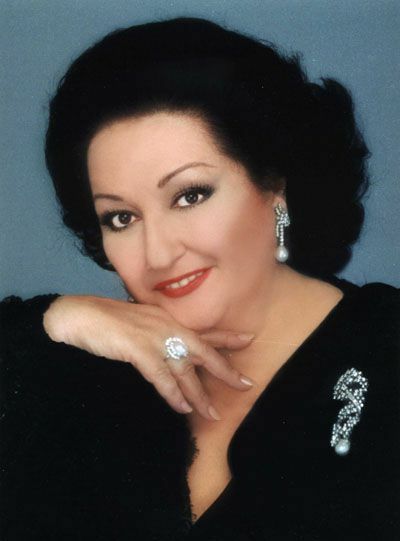 However, the ascendant almuten is Saturn, who is in detriment in the 7th house, indicating she is either controlled by her relationships or she simply makes bad choices in matters of love. Finally, the South Node is in the 8th house of death and Uranus is also there, very close to the cusp, indicating a sudden and unexpected death. In the solar return chart for the year of her death, we have some very interesting testimonies. First of all, both her significators, Saturn and Jupiter, rulers of the ascending and the intercepted sign in the 1st house, are in the 8th house of death. However, they trine the ascendant, Saturn is exalted and receives Jupiter. The worst scenario could have been avoided, if there hadn't been the two “lethal” squares with Mars, an Infortune in the sign of his fall and Mercury. Mercury is the ruler of the intercepted sign in the 7th house and therefore rules the husband. Thus, husband and death are connected. Now, SR Venus, domicile ruler of the SR 8th house, is conjunct the SR 7th house cusp. This could mean: a) Death of the husband. but we know that this didn't happen, b) a new woman in the life of her husband (possible, perhaps that was the reason of their fight) or c) death caused BY the husband. At the time of her death, in both primary and secondary directions, her natal Uranus in the 8th house was activated by the Asc/7th house cusp axis (how exact the aspect was depends on the accuracy of her birth time) and also natal Venus (herself) was opposite primarily directed Saturn, the great Infortune. A very bad time for her indeed. One final indication that connects Robert Wagner with Natalie's death is that Robert's ascendant falls exactly on Natalie's North Node/South Node axis which is located in the 2nd and 8th house and therefore the most personal point in his nativity is directly connected with her death. Does all of the above make him a killer? No, not necessarily. Astrologers don't have crystal balls, nor are they psychics. We just try to interpret astrological symbols. Still, just like in real life, there is enough astrological evidence to make him “a person of interest”. Ingress charts cannot usually be relied upon to provide specific information for a particular country, because neighbouring countries quite often have the same ascending sign and the same house cusps more or less. The things to look out for are conjunctions of fixed stars with the angles, almutens of house cusps or where in the world important aspects are angular. This year, in the Aries ingress chart, we have a Sun square with both the Infortunes, Mars and Saturn. The Infortunes are both dignified, but still a square with both the Infortunes is not a negligible matter. These squares or the Mars/Saturn conjunction by itself are angular in the ingress chart of the United States, Canada, Russia,Turkey and Syria among others. The closer to the angles, the stronger the influence. We'll just have to wait and see. Here is the review published in the latest issue of The Mountain Astrologer magazine. 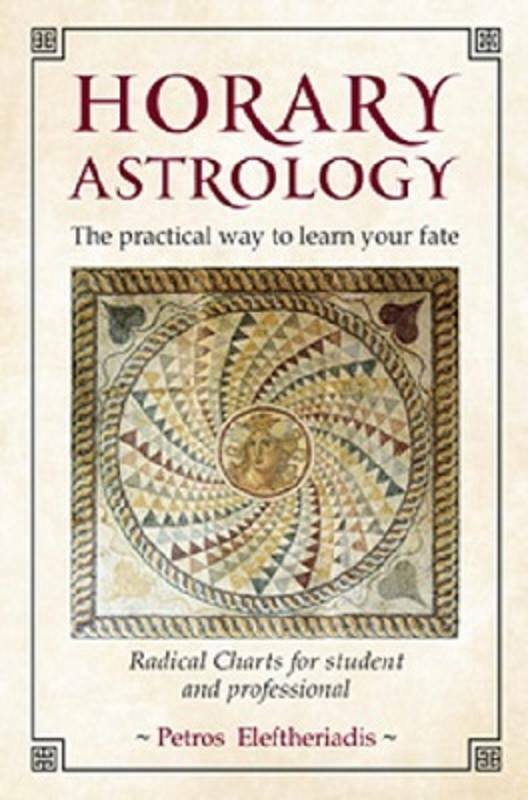 Horary Astrology: The practical way to learn your fate by Petros Eleftheriadis, The Wessex Astrologer Ltd, 4A Woodside Road, Bournemouth, BH5 2AZ, England. 2017. 146 pp.$16.49 (£12.50) (ISBN 9781910531211). Available from any online bookseller. 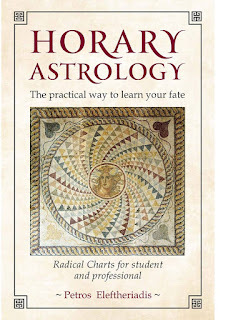 The book begins with a brief theoretical exposition of horary, and explains the terms before delineating the example charts that form the heart of the book. The 55 charts are divided by topic: Money; Relationships; Career and Achievement; Sport; Health, Sickness, and Death; and Various Issues. As we have come to expect from Wessex, the book is beautifully designed: The relevant chart is displayed, the question and its context are stated, the Querent and other significators are identified, and Testimonies for and Testimonies against are listed. This is followed by the Judgement, the Outcome, and Astrological conclusions – a nice feature that encapsulates the process, e.g., “When the Sun receives the combust planet, especially by domicile or exaltation, combustion is not completely destructive.” There is also a Glossary and a Bibliography. 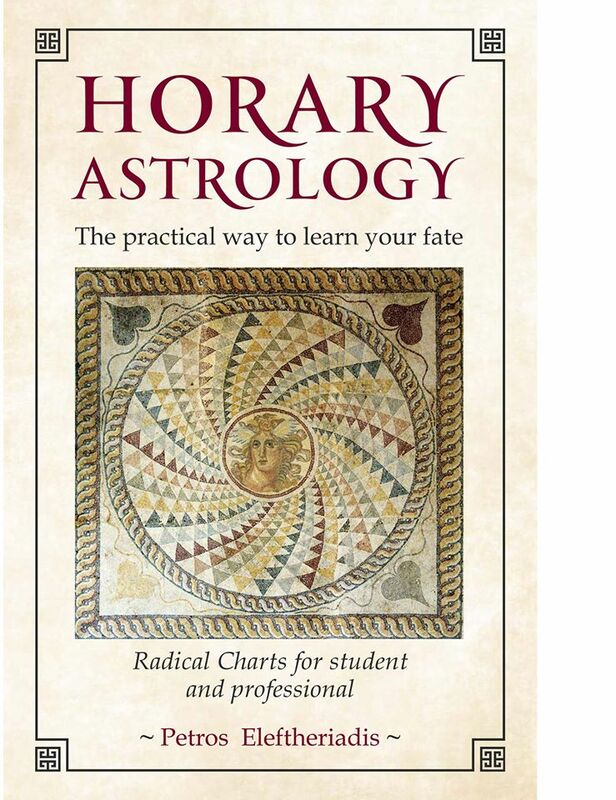 Although the book is exceptionally well written, it is not particularly a beginner’s book, as it assumes that the reader has some familiarity with horary. 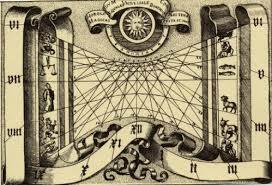 (Eleftheriadis includes his thoughts on such matters as the logic behind the sequence of the planets in the Egyptian bounds.) 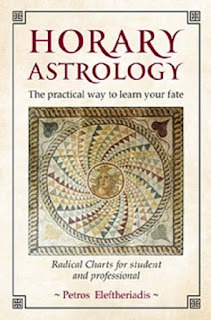 No matter how you currently approach horary astrology, you will learn a lot from Horary Astrology: The practical way to learn your fate. I’ve always liked the notion of the almuten and in my book, Horary Astrology, the practical way to learn your fate, I consistently use the almutens as co-significators and it is often the almuten that gives the correct answer and not the domicile ruler. Here is another striking example. This is the horary chart I cast for the 2018 Australian Open in Men’s Singles. I’m a Federer fan and therefore Federer gets the 1st house. His significators are the Sun and the Moon, by being in the 1st house (the Moon would be his co-significator in any case). The Sun is in the 6th house with no essential or accidental dignity, but the Sun is received by Satun in his own sign and this is very strong. His next aspects are sextiles with Jupiter and Mars, which is good, but neither Mars nor Jupiter are significators of the the 10th house, which would have made us more hopeful. However, even if they were significators of the 10th house, the sextile aspect usually needs a reception to work efficiently, especially in this case where the Sun has no essential or accidental dignity. Jupiter is in the face of the Sun, but this reception is negligible. The 10th house domicile ruler is Venus. Venus is combust, a very bad testimony. Yes, Venus is catching up with the Sun, who is Roger’s significator, but just because the Sun is a significator, this doesn’t send the combustion away, despite what some authors would have you believe. Both the Sun and Venus are received by Saturn, but this is not enough to counterbalance the combustion. Finally, the Moon doesn’t aspect either Venus or the Sun. This doesn’t look like a chart that can make Federer a champion. He may win a few rounds (the North Node is also conjunct the ascendant), granted, but not the trophy. However, there is another very important testimony that shows an easy Federer win. The 10th house almuten is the Moon and she is conjunct he ascendant. Victory is coming to him, without him having to work very hard. This is exactly what happened. He didn’t seem to be in his best form in the first rounds, but then things started to get his own way. Nadal was out because of injury (although he probably would have lost anyway to Cilic) and Djokovic was eliminated by NextGen star Chung who faced Federer in the semi-finals, but had to retire in the 2nd set again due to injury. So he didn’t have to work that hard to reach the finals where he met Cilic and beat him in five sets, the only really difficult match that he played. Please email me (petelefth@gmail.com) for details. The Leo parent - A contradiction in terms?